Show Time by Sue Stauffacher. An Animal Rescue Team Book. Review: Have you ever had to deal with squirrels that were too friendly with people terrorizing a college and a veteran's facility and also winning a jump rope competition at the same time? Well, an ordinary girl named Keisha has to deal with both of these. 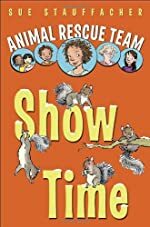 In the book Show Time (from the Animal Rescue Team series) by Sue Stauffacher, squirrels had been scaring some of the students and staff at a local college and it's up to Keisha and the Animal Rescue Team to stop them! But Keisha also has a jump rope competition to win. Can she do it all? Keisha Carter and her family's problems all change when they get a call from Mt. Mercy College, about squirrels frightening the students and staff! So the Animal Rescue Team (Keisha and her family) arrives at the scene to investigate. In order to gather up more clues about the situation, the team has to make some careful decisions about the squirrel situation. Meanwhile, Keisha has to deal with some of her own problems. The Grand River Steppers jump rope team has a chance of placing in the finals, but Keisha is so nervous that she keeps messing up her routine! While working on the squirrel situation, Keisha meets Sergeant Pinkham, a retired war veteran that is getting used to his new prosthetic. Keisha tells Sarge about her problems with her jump rope routine and her squirrel situation. He encourages her and tells her she will succeed but only if she stays focused and practices the routine. He just might be the person to help Keisha calm down, have fun and do well at the competition. Can Keisha get over her problems and do well in the competition? And will the team finish their problem with the squirrels? Show Time is a great book for kids from 2nd to 4th grade. It is a book full of laughs and surprises that make the reader want to continue reading. A part of the book that made me laugh was when Razi was performing his tap dance routine at the school performance and he fell on his bottom! Also, I liked how the author made the reader think of how the characters were going to solve their problems and decisions. For example, when they first wet to the Mt. Mercy College they didn't know where to start with their investigation. This made me think of where would be a good place for them to look first. I did not like that in one chapter it would talk about the squirrel situation but in the next chapter it would be something different with a new place and new characters. All in all, I think this book is great for someone who loves a few jokes and many surprises. Show Time deserves 4 out 5 stars. Review written by Sam K. (6th grade student). We would like to thank Random House for providing a copy of Show Time for this review. Have you read Show Time? How would you rate it?